Jewish folk songs, klezmer dance music, and religious melodies, collected by Ukrainian musicologist Moishe Beregovski on wax cylinders in the 1930s. Believed lost during Stalin's reign, the music was rediscovered in the 1990s. 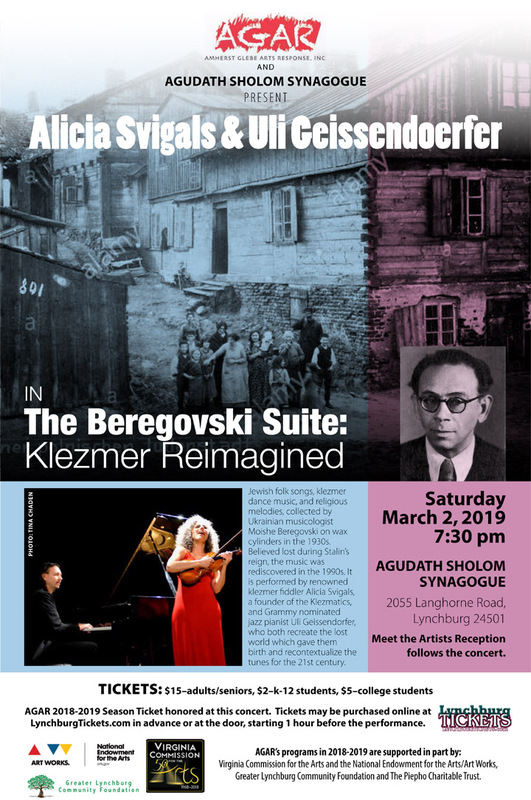 It is performed by renowned klezmer fiddler Alicia Svigals, a founder of the Klezmatics, and Grammy nominated jazz pianist Uli Geissendorfer, who both recreate the lost world which gave them birth and recontextualize the tunes for the 21st century. Meet the Artists Reception follows the concert. Seating is limited, reservations are recommended.